Two recent studies conducted on opposite coasts of the United States led to the same conclusion: real-world vehicle emissions have dropped considerably over time, and advancements in diesel engines and emissions controls are delivering measurable reductions in black carbon emissions (PM 2.5), nitrogen oxides (NOx) and greenhouse gases (GHG). In one of the studies, 9 percent of the fleet accounted for more than 70 percent of the emissions. The other found that the EPA emissions model substantially overestimated real-world emissions for most pollutants, by factors ranging from ~2x to ~100x. California's Air Resources Board (CARB) recently unveiled the results of a study conducted by Thomas Kirchstetter, Chelsea Preble and Robert Harley from the University of California, Berkeley. Over a span of eight years (2010, 2014, 2015, 2018), the team gathered emissions data from heavy-duty vehicles passing through the Caldecott Tunnel, located just outside of the San Francisco Bay Area. They compared results to measurements taken at a tunnel en-route to the Port of Oakland. Pollutants measured include black carbon (PM 2.5), nitrogen oxide (NOx), ammonia (NH3) and nitrogen dioxide (N2O) emissions. The fleet sampled included drayage (short haul) trucks, dump trucks, cement mixers, tractor-trailer trucks, flatbed trucks and construction equipment registered in the state of California, spanning in age from model year 1985 to 2017. Measured emission factors were matched to the license plates of vehicles actually passing through the tunnel, linked on a truck-by-truck basis with chassis or engine model year and any verified-installed diesel particulate filters (DPFs) to correlate the measured emissions with the heavy-duty vehicles, as well as to cross-check the age and compliance status of the vehicles. Under real-world conditions, diesel particulate filters (DPFs) systems reduce black carbon emissions by 97 percent compared to pre-2004 engines. When a selective catalytic reduction (SCR) system is added, heavy-duty diesel engines cut black carbon emissions by a further 81 percent, compared to pre-2010 engines. Model year 2010 and newer trucks, which use both DPF and SCR systems, deliver emissions levels below today's requirements: 0.02 g/kg of particulate matter. Diesel trucks are a minor source of NH3 and N2O emissions, both minor contributors to greenhouse gas creation; the implementation of SCR systems increased these emissions. The reduced black carbon emissions delivered by DPFs, combined with the fuel economy gains delivered by SCR systems, far outweigh the effect of N2O global warming increase. The Health Effects Institute (HEI) published the results of a tunnel study conducted between 1992 and 2015 at the Fort McHenry Tunnel, located outside Maryland's Port of Baltimore. Results were compared with a similar emissions inventory conducted between 2003 and 2015 at the Shing Mun Tunnel in Hong Kong. The purpose of the study was to validate estimates made by the most popular emissions model used to inform U.S. air quality regulations: the MOVES model. HEI concluded that the MOVES model substantially overestimated real-world emissions for most pollutants in Baltimore's Fort McHenry Tunnel by factors ranging from ~2x to ~100x. Alongside this conclusion, the data gathered by the study demonstrated a substantial decrease (78 to 96 percent) in vehicular emissions from both light-duty (non-diesel) and heavy-duty (diesel) vehicles between 1992 and 2015 in the Fort McHenry Tunnel. Similarly, the study revealed an 80 percent decrease in PM 2.5 emissions between 2003 and 2015 in Hong Kong's Shing Mun Tunnel, most likely due to the adoption of Euro V standards and implementation of SCR retrofitting by Hong Kong's government. The primary motor vehicle emissions model in the United States ("MOVES") substantially overestimated actual measured emissions by factors ranging from ~2x to more than ~100x for a number of pollutants. Mobile source models like MOVES are the centerpiece of air quality planning and control policies at the federal and state levels. In the case of California, a small number of vehicles were responsible for a majority of the emissions. Investments in the newest generation of diesel technologies are helping cities, municipalities and states achieve significant clean air improvements. Since 2011, new commercial trucks sold in the United States achieve near-zero levels of emissions, meeting CARB and U.S. EPA standards for both ozone precursors (NOx) and PM 2.5 emissions. The findings in these two studies should be an indication that there is a need for a greater policy focus on gross emitters, emissions control system tampering and in-use emissions. This new generation of advanced diesel technology is also having a positive climate impact because it is more fuel efficient, which translates into lower GHG emissions, and is near zero emissions for black carbon, a short-lived climate pollutant. Relative to previous generations of technology, these newest engines reduce emissions by 98 percent. Beyond these advancements, when coupled with low-carbon, advanced renewable biodiesel fuels, existing diesel technologies yield immediate clean air and climate benefits. Many municipalities across the United States, including many in California's Bay Area, have made the switch to renewable diesel fuel for transit buses and other heavy-duty vehicles and equipment. Accelerating the introduction of the newest-generation diesel technologies offers a means to achieve rapid and large-scale emission reductions. 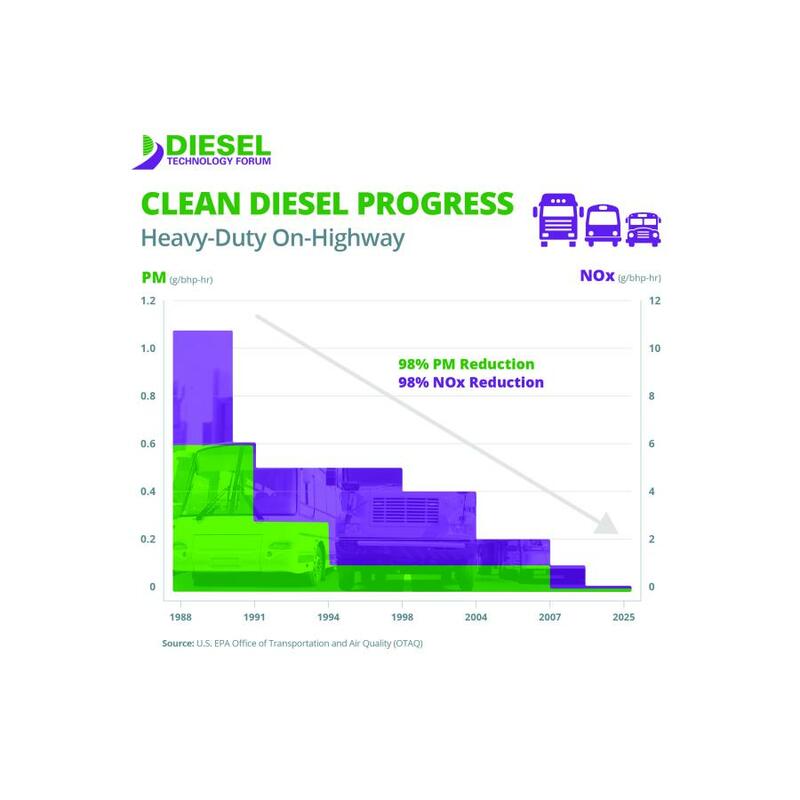 Advanced diesel technologies are contributing substantially to our nation's ability to achieve our climate and clean air goals today, with more possible in the future.